I just lost my cocker spaniel, Henderson. Henderson was my fur baby, there throughout all my 8 miscarriages and the successful pregnancy/birth of my son. I was so saddened, I did not want another dog. 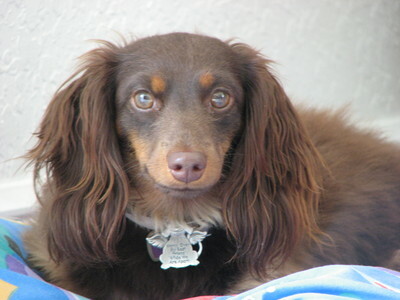 A co worker had a long haired doxie whom she “did not want anymore” and was going to put to sleep due to his failure at housebreaking. He came with the name Snickers, and on October 31. So, I kept the name and the dog. Snickers is the sweetest, funniest dog I’ve ever had. He makes me laugh and I love him so. He helped me heal my heart.